Lesson 9.4: QUIZ + What solution method should we use? Lesson 9.9: Review of Quadratics! ALL VIDEO NOTES AND THE WORKSHEET IS DUE FEB 22nd!!! Finish your Factoring Flip Book! HW: Complete 8.6 review Look over the Answer key . Don’t forget to finish your flip book! HW: Complete 7.4 poly shapes activity to review for your test on thursday! Answer key to last page of the review activity: We will go over the shapes part in class. Your Quarter 2 Exam will be during Regents Week. Your exam will either be Wednesday, January 27th from 9am-12pm OR Thursday, January 28th from 12:30pm – 3:30pm. Please consult your individualized Regents Week schedule to determine when your test is. . This two day test is all multiple choice questions and contains a full practice regents. The exam will cover all 6 units we have done so far this year and will count for 20% of your quarter 2 garde! Please look over the class Learning Targets to see what will be on this test. Look over your unit tests and class notes to review all material. Check the q2 review packet key to help you. Please email Ms. P. with any questions! Good Luck! Holy Educon! I am so excited and proud to say that Ms. Leimsider, Lissa, Taji and Lesley (three current sophomores and former algebra students) and myself presented at #Educon today on Mastery Based Learning! It was so fun to share information about our school and my crazy mastery system with other teachers and school people who are interested in transforming how we collect, use and communicate student data in our classrooms!! Check out the slides of our presentation! After learning about the different types of bridges, the history of the bridges of NYC, how bridges handle forces, the NYC Department of Transportation, designing bridges using the West Point Bridge Designer Software , creating blueprints, and building the bridges from just balsa wood and elmer’s glue, WE BROKE THEM! 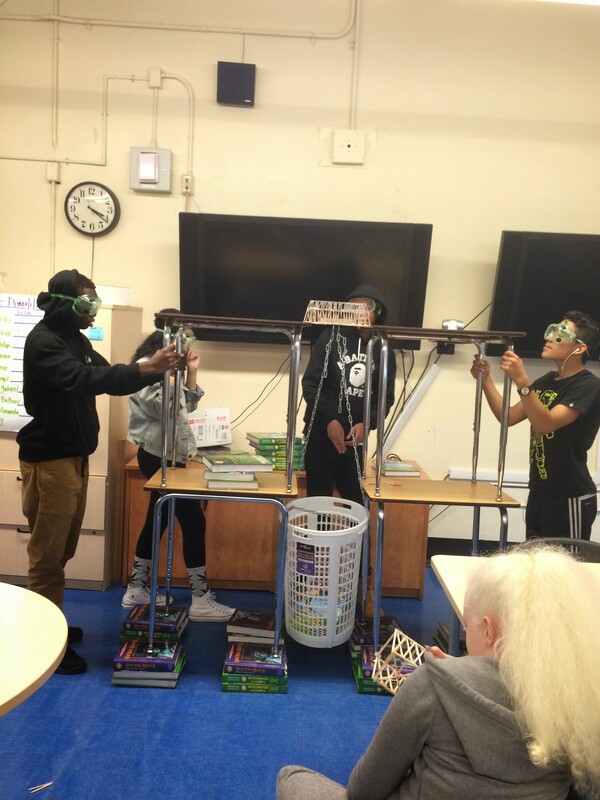 Students tested the strength of their bridges by seeing how many algebra text books they would hold in a laundry basket that was attached to a testing block inside the bridge. Congratulations to Luke and Phillipe, their bridge held over 25 lbs!!! The first quarter is almost over! It’s hard to believe that the second quarter will be starting next wednesday! It seems like I just met my new, freshmen advisory and that we just got started with the 2014-2015 school year! So far this year, master tracking has been going very well! Students are mastering algebraic topics and demonstrating what they know on assessments. 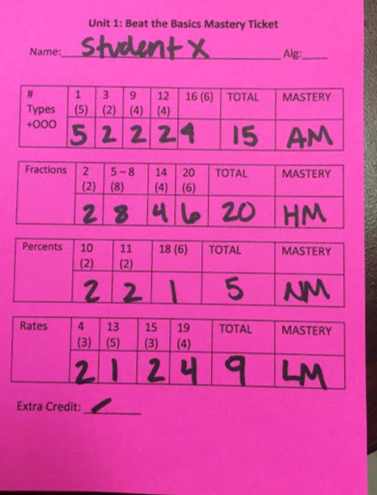 We keep track of each students mastery in the mastery tracker (pictured below). 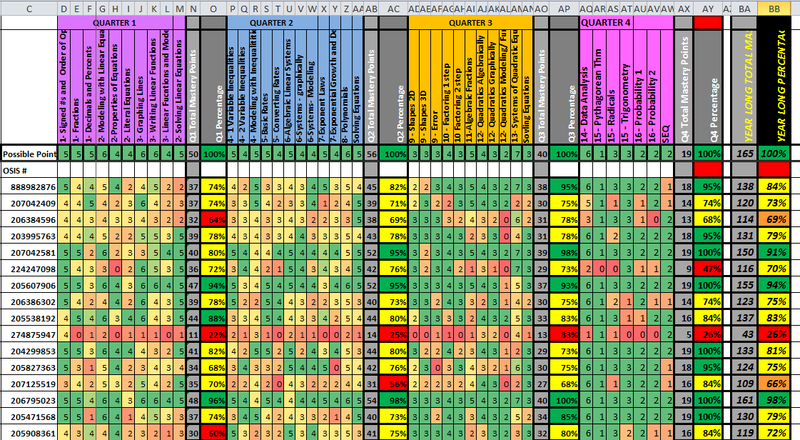 Each time a student demonstrates mastery on a topic they earn a Mastery Point which are tracked in this excel document. Kids can track their own mastery and compare it to their peers. If a student does not earn full mastery they can go through a corrections process on their assessment and take an alternative retake assessment to show what they have learned. This process gives students the opportunity to go back and truly master a topic that they didn’t quite get the first time around. It also provides, me as a teacher, with a tremendous amount of data! 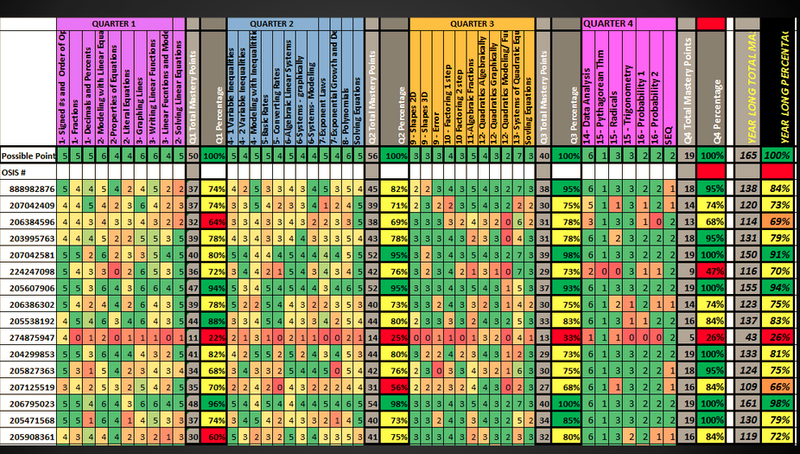 Instead of just seeing that student has a B or C in my class, or even what letter grade they earned on a test, I have detailed information about what specific topics, or skills students do understand and which topics they need to continue working on. This process makes our end of the quarter review a very differentiated, individualized experience in my classroom. Students are not sitting through an all class lecture about something that they already understand, in stead they are working on the topics that they have not fully mastered by watching review videos and working on practice sets with solution guides. And for those students who have earned full mastery on all topic and have identified that they feel confident with all topics, they are working on an enrichment task to push their thinking and help deepen their mathematical understanding of modeling. Wow, the paper engineering class has created some amazing sliceforms and stackforms! Sliceforms are 3d shapes that are created from cutting slices into paper and arranging the pieces perpendicularly. Stackforms are created from cutting shapes from cardboard and stacking the pieces up to create a shape. Students completed this Sliceform + Stackform Task and learned how to use Silhouette Software, 123D-Make and a Silhouette Cameo Paper cutter to create their projects. Last week we finished our second unit of Algebra, Solving Equations. The unit covered four major topics: Properties of Equations, Manipulating Equations, Modeling Equations, and Literal Equations. We also talked a bit about some of the pitfalls and common errors using cross multiplication. During this unit, each night students worked at their own pace through “The Gateway” – a progressively difficult set of equations to solve, where leveling up requires successful completion of the level before. Although a number of students made their way to problems on level 15 (the highest level) two students deserve special mention for completing level 15 successfully: Caden and Ariana. Let’s talk a little about PAPER ENGINEERING! So far the class is going really well. We are focusing on the ISTE STEAM (science, technology, engineering, art and mathematics) standards and the kids are creating some really great work. The kids worked on a three part Origami Task: 1. create three traditional origami items, 2. write out the instructions to make an item w/o photos, 3. a Choice project: $dollar$ bill origami, the fold and cut problem or create a mathematical origami project. Hi everyone and welcome back to school! This year Ms. P has two student teachers: Ms. Shube and Ms. Barlow. We just finished our first unit of Algebra, Beat the Basics. The unit covered five major topics: order of operations and signed numbers, fractions, rates, percents, and types of numbers. We also talked a bit about problem-solving strategies and solved some tricky problems. Can you determine how BIG Bigfoot is based on a cast of his foot? We thought about what we can determine from a problem without actually solving it. Given a string of numbers multiplied together, can we decide whether the answer will be positive or negative without actually calculating the answer? We ended with our first Unit Test, where students were able to demonstrate mastery of each of the topics. Special shout out to Monia Saleh for achieving 100% mastery on the first test! Remember, if you did not master everything, you can always achieve mastery through the Mastery Retakes process. We’ve already gotten started on Unit 2: Solving Equations. For this unit, students will be working each night on the Solving Equations Gateway, where they will work up the ladder until they can solve all levels of equations! Bridge Building is up and running for the 2014-2015 school year! The class started off with students thinking about what makes a strong bridge and how we can create bridges with gum drops and tooth picks. 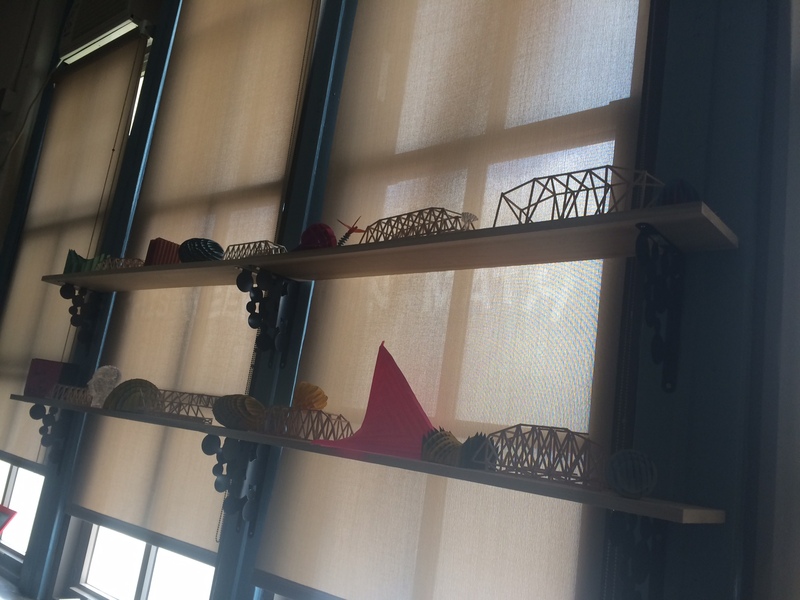 Students created bridges and towers from this task. One month down, one month to go, of summer that is. I think most people who aren’t really involved in public education think of teachers getting three glorious months of summer vacation. We don’t, really, we get two. Which is certainly nothing to complain about! But with only one month left of summer vacation, I wish there was more! I want to go on more adventures and do less work! But nevertheless, I’m at the iSchool today, working and planning. 1. Rewrite algebra map and adjust curriculum for the full implementation of the Common Core Algebra 1 standards and test prep. 2. Create a new class: Paper Engineering- write the syllabys and curriculum, but mostly just make a lot of awesome paper projects! 3. Do some serious prep for Senior Projects stuff. Here are some steps that I think you can follow to create and implement a unit that follows a similar system in your own classroom (ANY SUBJECT!) Please, feel free to reach out to me and ask questions or get help with your own system!!! 1. 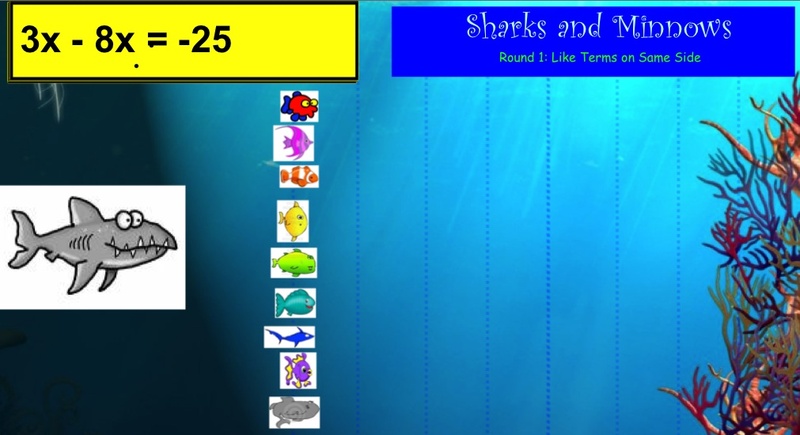 Pick a unit you will be teaching in 4-6 weeks- you don’t want to rush this! 2. Chunk your unit up into 3-5 ‘topics’ that you can track mastery on. 3. Write the learning targets for each topic. One topic can have anywhere from 1-8 learning targets. The LTs should be small, and in student friendly language! 4. Create an assessment that gives the student equal opportunity to display mastery on all of the learning targets for each topic. 5. 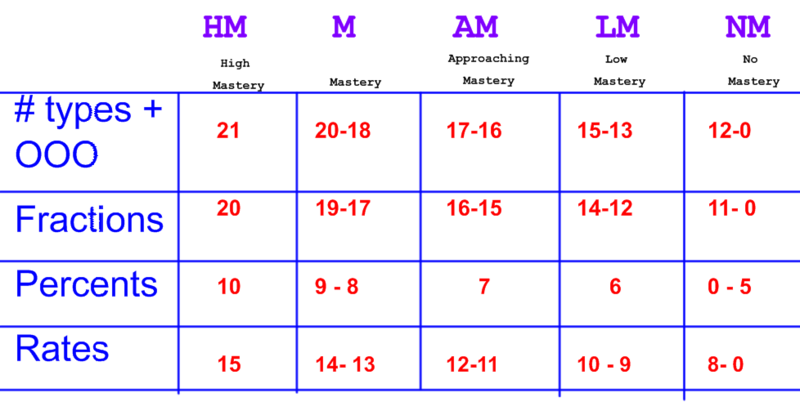 Create a rubric or scale that clearly assigns a Mastery Level for their work. 6. 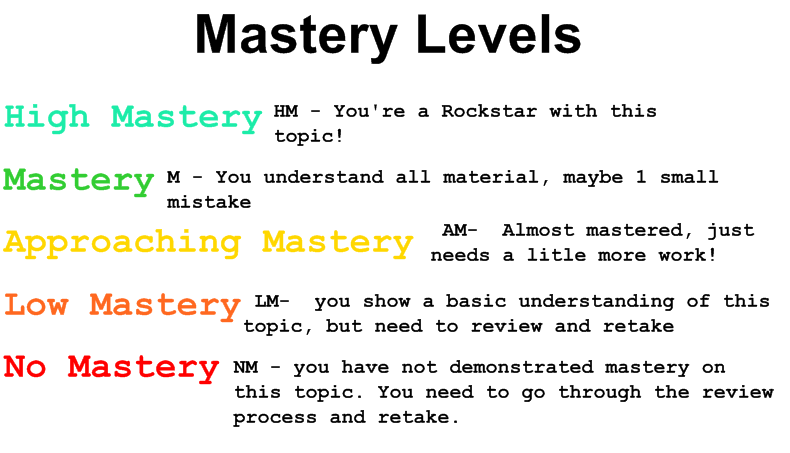 Create a mastery ticket if giving a test or quiz, or use the rubric if your working with a paper or project. 7. Determine how you will communicate the student’s mastery using your current grading system. 11. Teach your unit, give your assessment, share mastery levels and reflect. Think about if you can keep up with this work, was it helpful for you and your students? Did they enjoy it? Are there any changes you can make to improve your system? Talk to other teachers who are also engaging in this work!